Never before have I written two posts about the same painting. But this one from Vienna is more puzzling that it appears. Even in his earliest days as an artist, Pissarro was more interested in using paint on canvas than he was in creating a what most people thought was the perfect picture. The previous post discussed the strange composition which would have been easy if only it did not include that odd blank space and sliver of a house on the left. But that isn’t the only unusual thing—Pissarro seemed to be using the large spaces to demonstrate that brushstrokes can differentiate areas even when colors are almost the same. 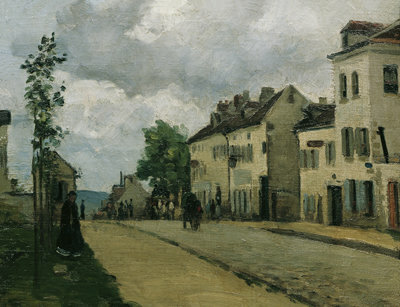 The predominant color in this painting is the yellowish beige of the houses and walkways. The clouds and hills are various shades of gray blue, and only the dark green grass in the lower left corner is markedly different. The grass is composed of large horizontal brush strokes, seemingly with a wide brush. The tiny furrows made by the stiff bristles are very evident from the bottom of the canvas to the vanishing point at the distant blue hillside. There is no difference in intensity or color in the grass of the foreground and that at the vanishing point. The walkway beside the road seems to have been painted with a smaller brush and more delicate strokes that form very shallow arches. In the foreground the path appears to be a bit lighter than at the horizon line, but the major clue to perspective is the narrowing of the path. The road cuts a diagonal swath across the canvas from the right corner to the horizon line, with a shallow walkway on the other side that ultimately disappears. The light on the roadway is directly opposite that on the walkway, appearing darker in the foreground and lighter toward the vanishing point. The brushstrokes on the road are also delicate but are different in shape from those of the path. They appear to be short wavy lines that are slightly diagonal. The construction of the houses are suggested with pale blue gray blocks on the pale yellow-beige walls. There is no attempt to paint realistic shutters. They are simply rough perpendicular strokes that are not always aligned. The cloudy sky gives Pissarro more opportunities for varied brush strokes. The clouds near the hilltop appear soft with circular strokes. The dark gray clouds at the top are also composed of circular strokes. The very white clouds in the center seem more ferocious than the dark ones because they are composed of wide brushstrokes in a herringbone pattern. It seems that Pissarro was using this painting almost like a “sampler” to show that the type of strokes can create important differences in various areas even when the colors are very similar. This canvas shows that he is as interested in the textures the paint creates as he is in recording a picture of a specific place. The biggest puzzle of all, however, is the woman in the black dress at the left. She is almost hidden in the shadows, and we would not notice her except for her white petticoat. Who is she? Why is she on the grass instead of the walkway? Why is she there at all? The painting would accomplish the same thing even if she were not there. It calls attention to this strange little group including the tiny little house, the row of three saplings and the woman. What do they mean? We will never know, but we do know that Pissarro often places elements in his paintings that cannot be explained. It is part of the charm in looking closely at his paintings. Perhaps Pissarro used ” different strokes for different folks ” as the saying goes………….Lois S.